NL3325 Goodyear Infinity is light in weight and offers a unique dual PVC external helix for superior flexibility - it has 3 times lower force to bend, improved abrasion resistance, and low coefficient of friction when dragged. Unlike some other drop hoses on the market, Infinity is suitable for regular use of biodiesel and ethanol blends, as well as gasoline and other petroleum based products with a maximum aromatic content of up to 60%. It is highly resistant to ozone, abrasion and weathering. All sizes come with a static wire for grounding. The banding coils are used for ease of installing "banded clamps" and to relieve bending stress at the fitting. Infinity is also available in a higher pressure version (NL3327) or a low-temp version (NL3326) for improved cold weather capabilities. Typical Fittings: Aluminum camlocks, crimp sleeves w/coil, strapping/sleeve for field repairs, tank truck accessories. Construction: Tube: Black nitrile synthetic rubber (static dissipating / static conductive). 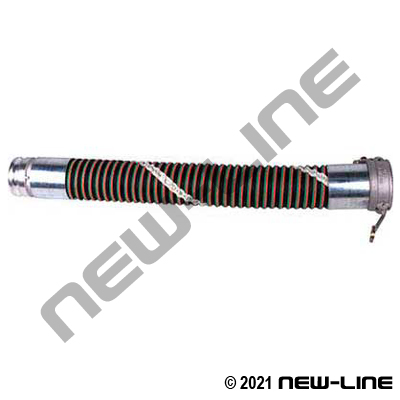 Cover: Dual Corrugated left-hand (counterclockwise) orange & green Pliovic helix with black nitrile rubber blend between. Reinforcement: Polyester fabric with an embedded static wire.